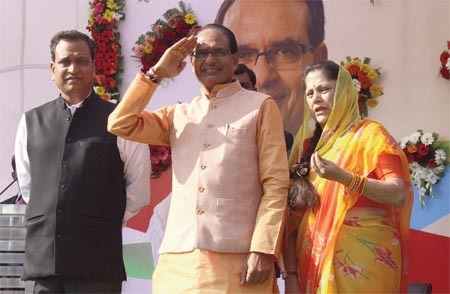 Bhopal. Sports and Youth Welfare Minister, Yashodhara Raje Scindia inaugurated the 3-day State Level Mukhya Mantri Cup Competition at TT Nagar Stadium. Scindia said that the main objective of starting the Mukhya Mantri cup is to identify the rural talent, affiliate them with our Sports Academy and prepare them for national and international level competitions. She said that introduced in 2014, the Mukhya Mantri Cup has proved to be helpful in selecting talent from rural areas. The Sports Minister said that from next year onwards all participants of the state –level Mukhya Mantri Cup will be provided track suits. Additional Chief Secretary Sports and Youth Welfare Mohan Rao, Director Sports and Youth Weldare Dr. S.L. Thaosen and about 1260 boys and girls of 10 divisions of the state were present on the occasion. The state-level Mukhya Mantri Cup competition includes players from Indore, Bhopal, Ujjain, Jabalpur, Gwalior, Chambal, Narmadapuram, Sagar, Rewa and Shahdol divisions. Kabaddi, Volleyball, Football, Karate, Wrestling and Athletics competitions will be played at TT Nagar stadium. The football competition of the boys category will be played at Motilal Vigyan Mahavidyalaya. The Mukhya Mantri Cup will be played from 8:00 am every day.